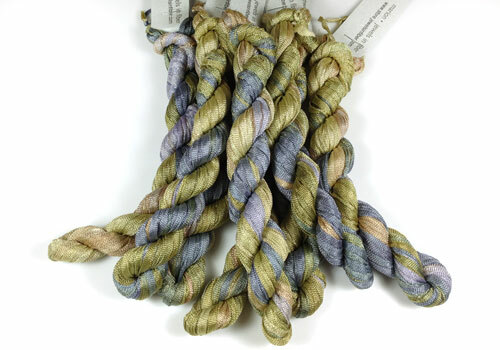 Variegated hand dyed rayon ribbon perfect for kumihimo with a knitted tube structure. An 8 strand round braid is 3mm in diameter. It can be braided as is or with beads. Beads can be added directly onto the ribbon as it collapses onto itself. The bead holes need to have soft edges such as high quality Japanese glass beads. The actual rayon fiber needs to be handled with care as it can be damaged or snagged when manipulated. Once braided, it is quite strong. 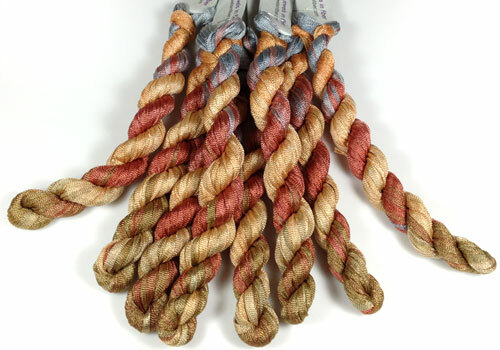 Hand dyed in the USA - Hand wash separately in cold water dry flat - Some dye may release in the first wash. Most Panache Ribbon has a tight knit, but some skeins are more loosely knitted, regardless of the knit type, it braids similarly. Note: Full skeins are hard to handle as the knit rayon ribbon is very slippery. 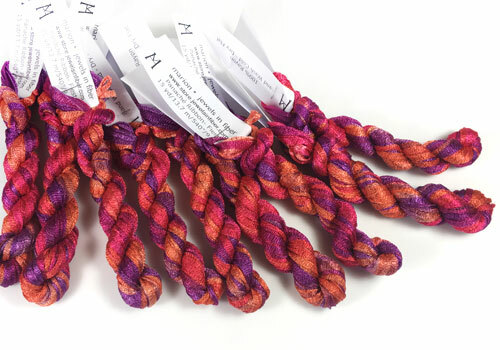 Use a wand to unwind the skein or have a helper hold the skein while you unwind it. Do not attempt to do it by yourself or without the right tools. 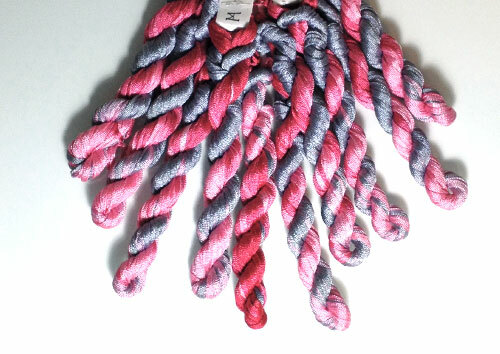 The 25 yd/23 m mini skeins include 18 skein turns 53 inches/1.3 m long. 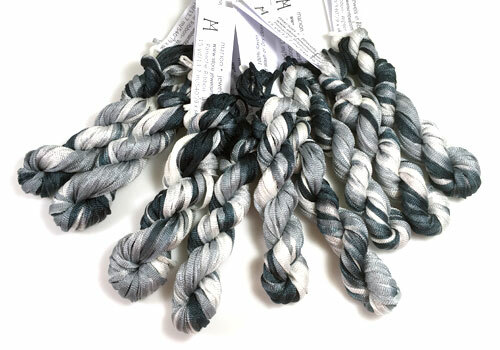 With 1 mini skein, using the ribbon singly with 2 skein turn per ribbon 104 inches/2.6 m long, you can make 4-5 bracelets, or 2 necklaces and 1 bracelet, or 1 extra long necklace and 1 bracelet. 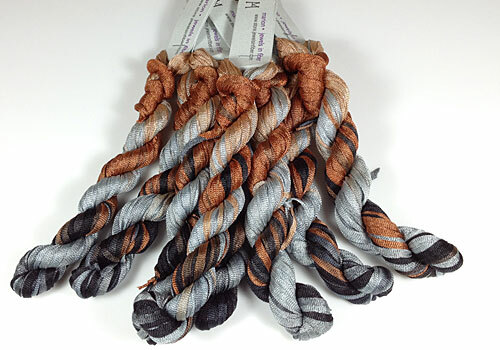 The NEW Panaché comes in 15 yd/13.7 m mini skeins with 9 skein turns 60 inches/1.5 m long. The extra turn is an extra, just in case you need it. 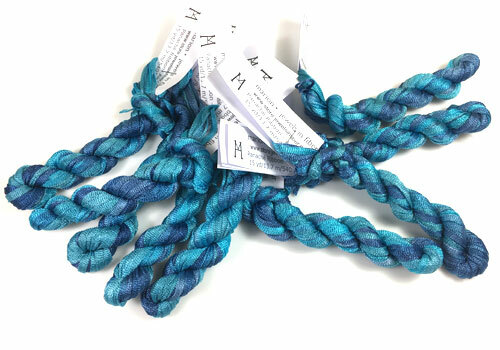 With 1 mini skein, using the ribbon singly, giving you a 60 inches/1.5 m length per ribbon, you can make 3-4 bracelets, or 1 necklace and 1-2 bracelet, or 1 long necklace. 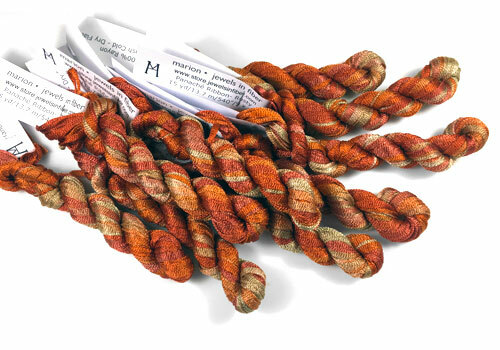 This yarn is recommended for the 'Twilight" knitted necklace in Betsy Bead, the book by Betsy Hershberg (p 48). White, Grey and Black, repeated 4 times and back around the skein. 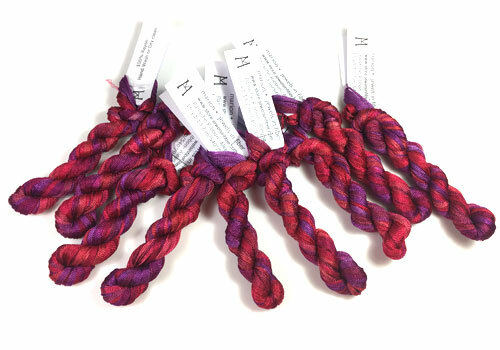 Reds, Magentas, and Purples repeated several times and back around the skein. Oranges, Hot Pinks, Magentas, and Purples repeated several times and back around the skein. 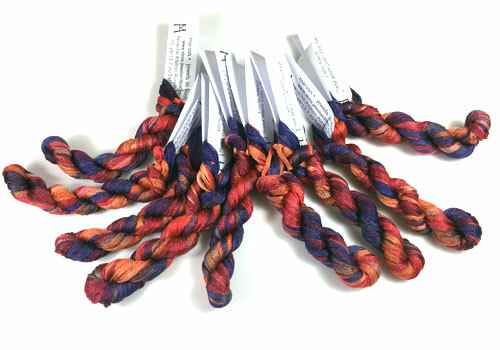 Purples, Magentas, Oranges, and Blues repeated several times and back around the skein. Burned Oranges, Burgundies, and Rusts, repeated several times and back around the skein. Just like a Calico cat without the white... Soft russet, followed by a soft grey darkening towards black then becoming a deeper rust. The color variation then reverses back to the soft russet mirroring the previous progression. Light Copper, Burned Oranges, Rusts and Tans, repeated several times and back around the skein. Soft Blue Grey, Sienna, Raw Umber softening to Sunset Peach, then all the way around back to the Soft Blue Grey. Like a Parrot Wing... Light Khaki, Heather, followed by Soft Olive, Raspberry and Blue, then back again. 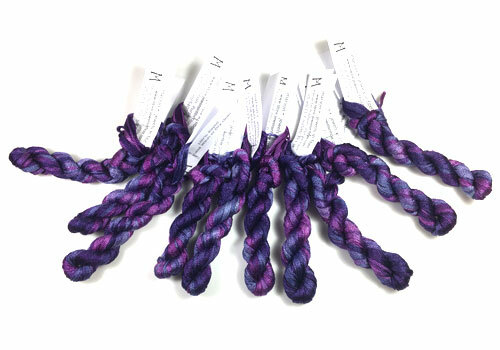 Purples, Violets, and Magenta repeated several times and back around the skein. 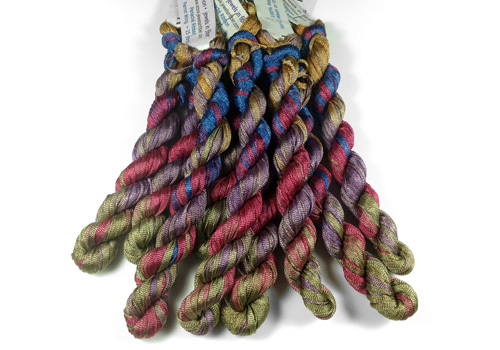 Blues, Purples, and Violets repeated several times and back around the skein. 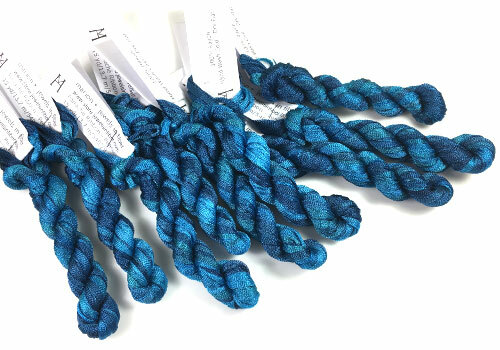 Aquas and Blues repeated several times and back around the skein. Peacock Blues darker to lighter repeated several times and back around the skein. 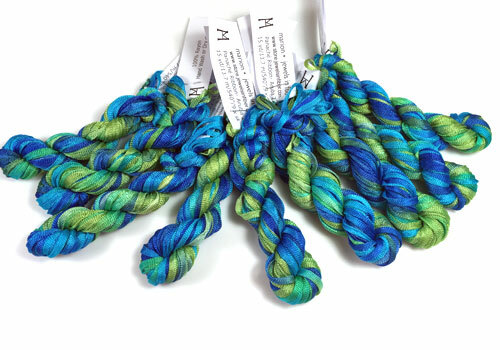 Bright Green, Blues, and Aquas repeated several times and back around the skein. Reminiscent of the Scottish Highlands... Soft Blue-Grey turning to Chartreuse, lightening into Blush, turning into Lavender and back again. Pink deepening to Cerise, back to pink lightening to Grey, then back to Pink. About yardage - Yardage of skeins is approximate. 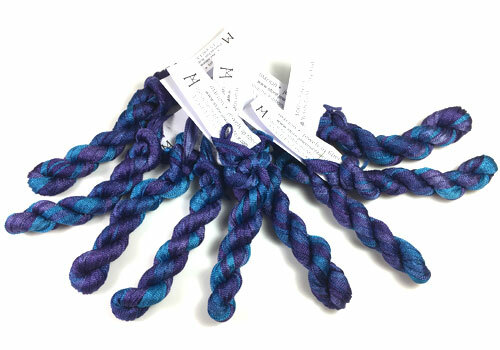 We wind our mini-skeins and we measure them by skein rotations, not by actual yardage. 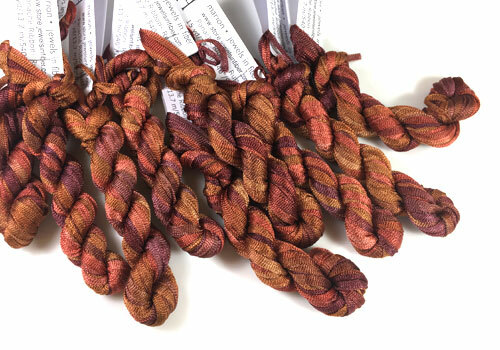 The skein sizes are fairly accurate, thus the yardage is fairly accurate on the mini-skeins. The full skeins are wound by our supplier, yardage is approximate.